When you’re on a long stretch on the road like I am, the Super Mario-like obstacles that impede your progress become less annoying and more comic. Some years ago, I stopped complaining about the “now” and focused on the “next” – the only problem about problem-solving is my mind often races in 5th gear when my body is in neutral. It all started earlier this week when my 2-day business trip got extended to 9 days thanks to the Oklahoma ice storms. The “now” was I wasn’t going to get home for a while. The “next” was a shopping spree at the JC Penney in Coralville, Iowa. I had three more games to produce and I didn’t feel right going to work in sweats. 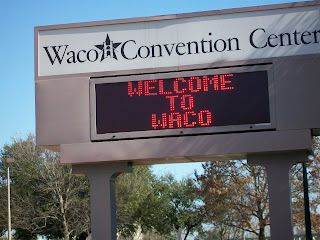 After 4 days barnstorming in Iowa (I can now identify in some measure with the presidential hopefuls), I headed for the final outpost between the road and home: Waco, Texas. On my half-filled commuter flight from DFW, some cowboy moved to the empty seat in front of me right before takeoff, then reclined his seat back all the way back as soon as we were in the air. This was a breach of frequent-flying etiquette and I pondered how to let him know. If it were longer than a 20-minute flight I probably would have kicked his chair or unfolded my newspaper in such a way that he’d be wearing it as a hat. But I let it go. It reminded me of the best revenge I ever got on a fellow traveler – it was many years ago. This husky 300+ pound guy sat next to me, dominated the armrest, fell asleep immediately and snored in my face for over 2 hours. When the flight was over, he had no clue where his shoes were. That was pretty mean, but it felt so good. So I landed in Waco about 8:45 on a Saturday night and got to the Hertz counter. But there was no agent. In fact, there was no agent at any counter. But I had a reservation. There was nobody to cry to, so I collected my mountain of baggage and found an airport policeman outside. It was a helpful conversation. EP: Excuse me officer, I have a reservation at Hertz, but there’s nobody there. COP: Yeah, she goes home about 6 on Saturdays. EP: Can I call a cab? COP: Might take about a half-hour. Waco’s only got one cab company and they’re clear across town. EP: Who do you have to be to get help around here, George W. Bush? COP: Well he’s just John Q. Citizen now. If his helicopter lands at this airfield at this time on a Saturday night, he’s SOL. He’ll just have to call his wife to pick him up like everyone else. I thanked him. I was just as helpless as before, but at least I was smiling. Out of the corner of my eye I caught the American flight crew piling into a hotel shuttle. I jumped in with them even though it wasn’t my hotel. I humped my gear a couple of clicks up to my hotel and got on line to check in. When it was finally my turn, an old woman in wheelchair cut me off – she nearly ran over my foot - and started asking the guy at the front desk a bunch of inane questions. What was I going to do? Tell off the rude old lady in a wheelchair? The front desk guy took pity and told her “let me check this gentleman in first.” My first victory in Waco. Not even the ATF could take it away from me. If you’ve never been to Waco, this is a very Christian town. The hotel doesn’t offer laundry service on Sundays. So here I am, at a coin-operated laundromat for the first time since I was an NYC bachelor. Oh, and I had to walk since I don’t have a car. But the trip will get better. We’re looking forward to enjoying the Super Bowl at Cricket’s. My man Bubba was in Vegas for last night’s big UFC battle and he threw down some scratch for me. Big Monday is at Baylor for the first time in 8 years and it should be a great scene. And I will be home in 48 hours. But got to finish the job in Waco on the way.